1. How are sunbeds and sunlight alike and different? The UV portion of mid-day summer sunlight is made up of about 95% UVA light and 5% UVB light. The majority of tanning lamps in sunbeds emit essentially the same mixture, but with higher intensity, usually 2-3 times more intense. That’s why professional tanning salons control the duration of your exposure – short sessions that typically only last a few minutes – based on the UV output of the sunbed and your individual skin type and tanning history. Generally, the higher the intensity of a sunbed, the shorter the session. It’s simple math. Your total exposure to the sun or a sunbed is based on the intensity of the UV light multiplied by the total exposure time. So if the sunbed you’re using is two times more powerful than sunlight, your tanning professional uses a recommended exposure schedule as a tool to carefully assign your exposure time. Sunbeds with higher intensity generally have shorter exposure times. It’s a protocol calculated to deliver three-quarters-or-less of what would induce a sunburn for your skin type. For millions of Americans, this system is the best way to gradually build a “base tan” which, combined with sunscreen usage outdoors, helps prevent sunburn. The photo-protection of a suntan, in proper combination with sunscreen outdoors, is more protective against sunburn than sunscreen use alone – which is why many practice the responsible usage of sunbeds. 2. How much UV light should people get? Overexposure to UV from sunlight or from a sunbed means something different for a fair-skinned red-head than it does for someone of southern European or African descent. It’s not one-size-fits-all. Professional indoor tanning facilities today are teaching a balanced message that overexposure is to be avoided and that non-burning exposure – for those who can develop a suntan – is the standard. ASA encourages sunbed salon patrons to visit professional sunbed facilities that are fully trained to deliver the most positive experience for all clients. Trained operators carefully evaluate each client for skin type, UV history, and more. In fact, professional salons that operate under ASA guidelines direct the fairest-skinned consumers (skin type 1) to use non-UV spray tanning and are not allowed to use UV equipment. Consumers at these salons are presented with material outlining the potential risks of UV light, protective eyewear for UV tanning, and safety procedures for both UV and non-UV spray tanning. 3. Isn’t UV exposure from the sun or a sunbed carcinogenic? The National Institutes of Health’s definition of “carcinogen” carries this critical explainer: “The Report does not present quantitative assessments of carcinogenic risk. Listing of substances in the Report, therefore, does not establish that such substances present carcinogenic risks to individuals in their daily lives.” That’s why birth control pills, red wine and salted fish are also on the list. They aren’t carcinogenic in their intended dosages. 4. 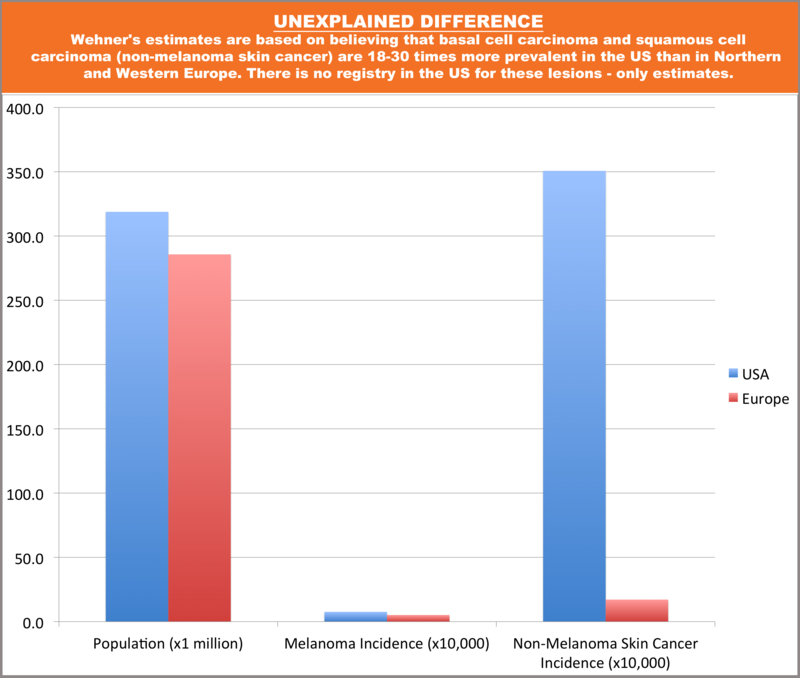 Is UV exposure the biggest risk factor for melanoma? More accurately, UV exposure is the major “environmental” risk factor, but other hereditary factors are much more significant: having more than 40 moles, having a changing mole, having red hair and fair skin are all much larger risk factors – independent of sun exposure. We’ve known for decades that melanoma is more common in INDOOR WORKERS who receive 4-10 times less cumulative sun exposure than outdoor workers, which affirms that its relationship with UV — and there is a relationship — is not straightforward. Again, there is nuance to the sun care message. 5. What about all the studies that say suntanning is harmful? None of the studies used to vilify indoor tanning have ever been designed to isolate and measure the effects of non-burning UV exposure. That is the problem. Most research on the risks of UV exposure comes from retrospective survey data (often self-administered surveys) – studies that cannot reliably isolate independent variables, such as assessing whether subjects sunburned repeatedly or exposed themselves responsibly. That limitation, especially as it relates to studies on sunbed use, is becoming more and more important in revealing the need for better study models. Consider: There are many applications for sunbed use today – (1) Medical use of sunbeds to treat cosmetic skin diseases, (2) Home use of sunbeds for self-treatment of cosmetic skin diseases and suntanning, and (3) Professional sunbed salon usage of sunbeds under the supervision of a trained operator. Unfortunately, research on this topic often mixes these groups together incorrectly. For example, a 2006 meta-analysis by the World Health Organization (WHO) alleged that sunbed usage increased the risk of melanoma 75 percent for those who start tanning before age 35. But of the 688 subjects in that meta-analysis, 344 used either home sunlamps or dermatologic sunbeds in a doctor’s office – categories that produced the greatest risk. “We found very few studies that examined the relationship between exposure to indoor tanning devices and risk for squamous cell and basal cell carcinoma, after adjusting for all important confounders. Results generally suggest no association. However, a slightly larger body of higher-quality evidence suggests that ‘regular’ or ‘early’ use of indoor tanning devices may increase the risk for developing melanoma (range OR, 1.55 to 2.3). Most of these studies used crude measures of indoor tanning exposure. Lushniak: It’s difficult to say. We’ve seen increases [in melanoma cases] – almost a tripling over the last 30 years. And of course, the question is, is it based upon ultraviolet exposure? Increased outdoor activities? The indoor tanning industry and artificial sources of ultraviolet radiation? From our perspective, the real concern is that this is an increase, and we need to do something about it. Washington Post: But we don’t know for sure what’s causing the increase? We acknowledge that there are risks associated with overexposure to the sun and sunbeds, including skin cancer. But it’s important that we keep these risks in perspective while determining public health policy decisions. Discussion of the nuance and critical confounding factors in the research isn’t happening yet. It’s time for a balanced discussion about the risks of UV exposure from any source – sunbeds or the sun. 6. Is melanoma increasing fastest in young women? Data from the National Cancer Institute (NCI) shows that melanoma is nearly twice as common in men as compared to women and is increasing fastest in men over age 50 – the group least likely to use sunbeds. 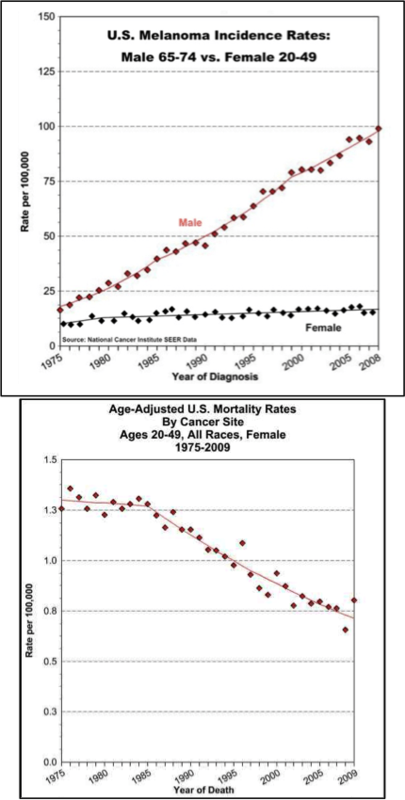 According to NCI, melanoma mortality rates have increased 450% since 1970 in men over age 50, but have decreased by 2.3% per year in women under age 50 since 1985. 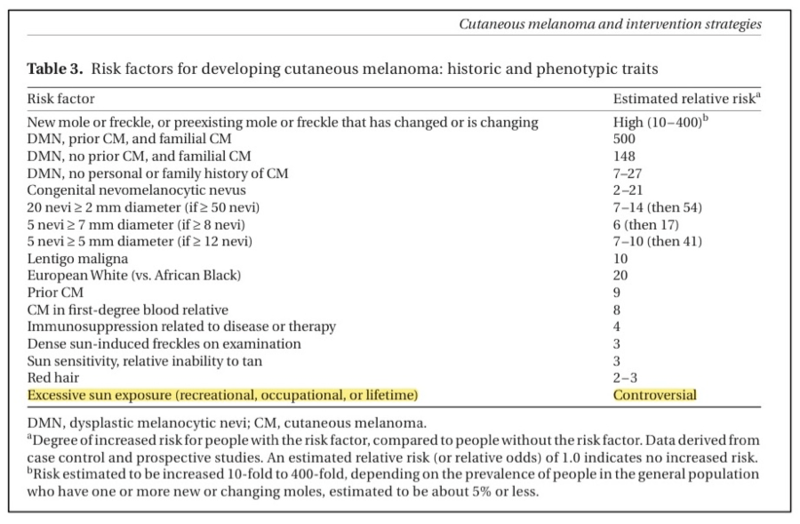 So while it is appropriate for people both sexes and all ages to remain vigilant about sun care, it isn’t accurate to say that melanoma is increasing especially in females. 7. Can tanning be compared to smoking cigarettes? No. In the United States, tobacco use is responsible for nearly 1 in 5 deaths; this equals about 480,000 early deaths each year. That number is approximately 37 times greater than the total number of skin cancer deaths in the United States annually (12,980) – the overwhelming majority of which occur in men over age 50 who never used a sunbed. The purveyors of this reckless comparison base their misstatement solely on one paper – a discredited meta-analysis of self-administered survey data. The paper in question attempts to extrapolate that the number of people who said they “ever had” one sunbed session on self-administered surveys — without reliably confirming or accounting for that or other sun behavior or genetic factors — can be used to project how many people will get skin cancer based on the author’s own creation of a daisy-chained projection based on no real collection of reliable information. Example: The United States and Northern and Western Europe have substantially similar mortality rates for Basal Cell Carcinoma (BCC), Squamous Cell Carcinoma (SCC) and Melanoma skin cancers—all numbers that are counted in registries. But the non-registry-related estimate calculations for SCC and BCC are 30.7 and 18.4, respectively, times greater in the United States than for a similar population in Europe. Given similar mortality rates in the two regions for the same cancers, it is clear that the disproportionately higher incidence rate in the U.S. results from the reporting of non-cancerous lesions removed by medical procedures in the U.S., often under the pretense of being “pre-cancerous.” Such lesions generally are not removed nor reported in European countries, with no effect on mortality. If it’s true that tanning is similar to tobacco, how could a dermatologist ever justify treating a patient with UV light or referring a patient to a tanning salon (as many do) for the treatment of cosmetic skin conditions? That would be like telling a patient to SMOKE A CIGARETTE to treat psoriasis. 8. Do dermatologists use and recommend sunbed usage? Yes. 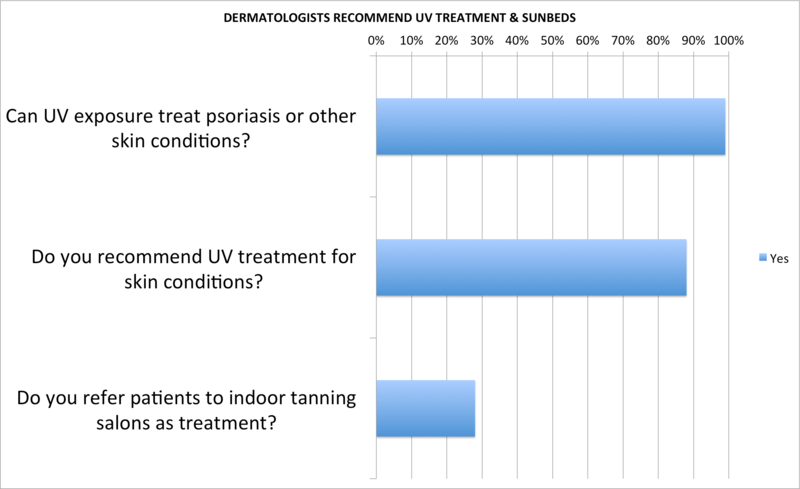 A 2015 survey commissioned by GrassrootsHealth found that 99 percent of dermatologists believe that UV is therapeutic in treating cosmetic skin conditions, 88 percent recommend UV treatment or use their own sunbeds to treat client’s cosmetic skin conditions and nearly 30 percent of dermatologists refer clients to tanning salons as an inexpensive means of self-treatment. The dermatology community has lobbied aggressively to increase accessibility to “safe” UV treatments – procedures that often involve higher UV doses than tanning salons deliver – by legislation that would strike insurance co-pays in order to increase phototherapy usage, which is referred to as “safe.” It’s a huge contradiction that underscores the complexity of this issue. Dermatology is maintaining that its usage of high-intensity UVA dermatology sunbeds (whose standard course is three sessions a week) have an “unknown” link to skin cancer. Yet AAD compares lower-intensity salon sunbeds to tobacco and arsenic? 9. Is tanning an ‘addiction’? UV exposure is a natural attraction. Nearly all living things naturally crave sunlight exposure. And most of us naturally feel better when the sun is shining and it’s not dark and gloomy. UV exposure to the skin triggers the production of endorphins, substances that trigger a “feel good” response in the brain. These same endorphins are produced with other natural activities too, like running, biking or swimming. It’s nature’s way of re-enforcing a natural attraction. Yet some have used this natural process to characterize tanning as an addiction in the same category as heroin. 10. Do sunbeds make Vitamin D? Vitamin D production takes place when we expose our skin to ultraviolet-B (UVB) emitted in sunlight and by the vast majority of sunbeds used in indoor tanning salons. While the North American indoor tanning industry conducts indoor tanning as a cosmetic service and acknowledges that you may not need to get a tan to produce vitamin D, an undeniable physiological side effect of this service is that indoor tanning clients manufacture vitamin D as a result of indoor tanning sessions. Peer-reviewed studies have established that sunbed users typically have significantly higher vitamin D levels when compared with non-tanners. One Canadian study showed that sunbed users in Canada have the highest vitamin D levels in that country, and that most Canadians are vitamin D deficient. Still other studies have generated similar results. Even though vitamin D production is triggered by UVB exposure, it’s important to remember that natural sunlight is mostly UVA – just like most sunbeds. The UV portion of mid-day summer sunlight is made up of about 95% UVA light and 5% UVB light. The majority of tanning lamps in sunbeds emit essentially the same mixture, but with higher intensity, usually 2-3 times more intense. 11. What are the policymaking implications of the scientific research surrounding UV exposure? In 1995, the American Academy of Dermatology lobbied the U.S. Food and Drug Administration to ban indoor tanning completely, based on a statistic pulled from a small subgroup of one 1994 study. That statistic was promoted for several years, appearing in press reports about tanning despite being debunked by FDA as not truly representing the study’s data and is no longer used today. That statistic – that 10 sunbed sessions increased melanoma risk seven-fold – lacked rigor from the start (its data set also suggested that sunscreen usage doubled melanoma risk, a finding that was divergent and was obviously never publicized), but affected policy and debate for almost five years (Page 7 of this link). In 1996, the American Academy of Dermatology presented research at its annual media day that claimed by 2012, melanoma would be the leading cause of cancer mortality in people of all skin types. That never came close to being true – in fact, melanoma mortality has decreased steadily in women since 1985, while increasing in men, according to the National Cancer Institute’s own data. Again, the data fueling this claim were never evaluated. In 2002, dermatology leaders promoted a study they claimed involved tanning salon sunbeds, despite the fact that most of the data came from usage of sunlamps in homes by fair-skinned people (95% of the data set) in the 1970s before tanning salons existed. This study is still cited today, despite the fact that its authors acknowledged in the text that results “did not achieve statistical significance.” Yet again, this study went unchallenged, and fueled many policy decisions. In 2009, dermatology leaders claimed sunbed usage before age 35 increased melanoma risk 75%, despite the fact that half of the subjects in the data set were using either medical phototherapy units or home tanning sunlamps. When data from tanning salon sunbeds was broken out, the risk became statistically insignificant. This statistic has since been discredited as not applying to tanning salons and removed from the CDC’s website, but resulting regulations remain in effect. In 2014, dermatology groups claimed that sunbed usage is more dangerous than tobacco based solely on one paper – a discredited analysis of self-administered survey data that was inherently incapable of supporting such a statement. (See #7 for detail.) Unfortunately, this message is still being used today. Dermatology organizations have called their use of sunbeds safe, but have referred to lower-intensity indoor tanning units as deadly. Vitamin D researchers worldwide are calling for the population to get regular sun exposure again, calling vitamin D deficiency an epidemic problem. Sunscreen manufacturers and The Skin Cancer Foundation have called for daily use of sunscreen products year-round to block ALL UV exposure. The North American professional indoor tanning community has called for sunburn prevention and skin-type related sun care. We support the development of consensus methodology in this field, in order to ensure that the quality of research is evaluated objectively and that thoroughly conducted studies are given proper consideration. With this knowledge in hand, stakeholders (including policymakers, legislators, regulators, clinicians, and public and commercial entities) will be better able to evaluate the utility of research methods regarding UV exposure and human health. This endeavor is called a “rigor project.” It would be led by an independent scientific organization that specializes in developing standards for consumer-related safety research. The project would distinguish credible science from poor-quality or agenda-driven research. It’s a modest request, but it is an endeavor that is sorely needed for the betterment of public health recommendations.